I find it nearly impossible to end a meal without something sweet to nibble on. Whether it’s a piece of fresh fruit or a small square of chocolate, my taste buds crave a hit of sugar for complete satisfaction. Following a dessert-less family dinner at Hearth Restaurant in the Lower East Side, I dragged The Astronomer up the street to ChikaLicious Dessert Bar. While my dear Astronomer was perfectly content with the taste of braised goat pappardelle lingering on his palate, I insisted on a three-course dessert tasting. Opened in 2003, ChikaLicious is an adorable 20-seat eatery built around an open kitchen where desserts and wine reign supreme. 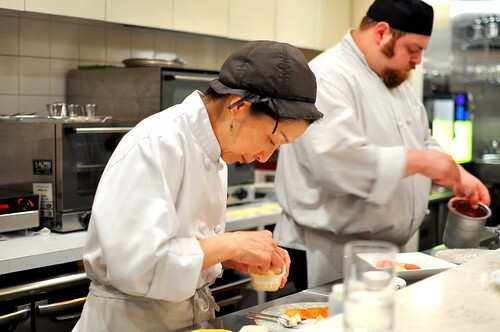 The restaurant’s chef and owner Chika Tillman (pictured above) trained at the French Culinary Institute and most notably worked under Tom Colicchio at Gramercy Tavern before striking out on her own. ChikaLicious serves a three-course prix fixe menu for $14 that includes an amuse, choice of dessert, and assorted petits fours. A wine pairing can be had for an additional $8. 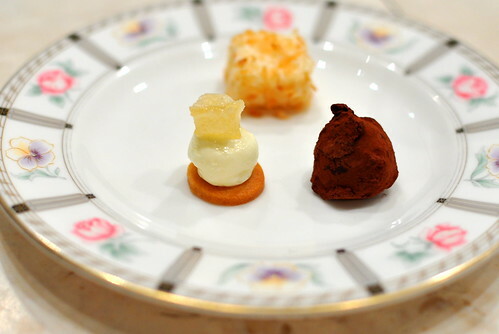 Chika’s suite of sweets have been described as American desserts with French presentation and Japanese portions. Even though I had eaten a hearty Italian meal moments before, polishing off all three courses was a breeze. 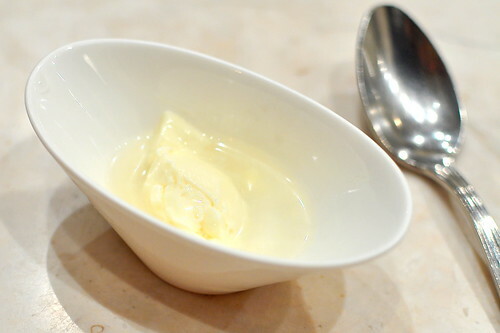 To start, the chef sent out a coconut cream and lemongrass soup. Every spoonful was refreshing and decadent; it was a tropical Southeast Asian dream. 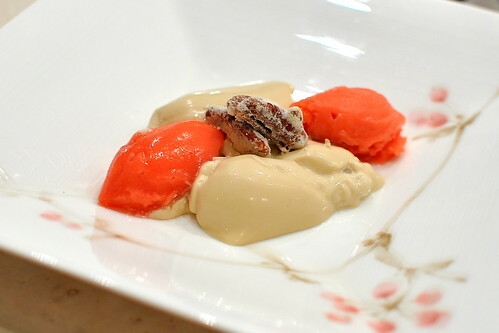 For course number two, I selected the brown sugar panna cotta with strawberry sorbet and frosted pecans from the list of desserts available. I found the flavors just sweet enough and appealingly light. Texturally, however, the landscape was rather runny since the panna cotta wasn’t firm and the sorbet grew softer by the second. Thank goodness the nuts brought some much-needed crunch. The final course was a plate of one bite wonders featuring a dark chocolate truffle, a coconut marshmallow, and a tiny cookie topped with buttercream and a fruity gelee. These disappeared much too quickly. Thanks for sending me to ChikaLicious, Kung Food Panda. It was a fun little spot to satisfy my insatiable sweet tooth. what a peculiar panna cotta! 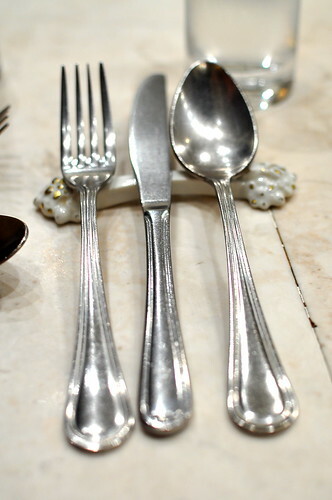 love the silverware set-up and that little cookie sculpture. Satisfying the insatiable — high praise indeed. LOL. Was lucky enough to visit Chikalicious when I was last in NYC. Still dreaming of the amazing little desserts we had there. I love the idea, and such a reasonable price for 3 courses!